It’s about that time again—application period for Spain’s North American Language and Culture Assistant program! This year I’m working as a language assistant in a bilingual elementary school in southern Spain. To be honest, there’s no way I could have made it to where I am today without the help of many informative, helpful, and quite funny bloggers who have chronicled their journeys from America, to Spain, and back (or not, if their romantic status changed over here). Below, I’m going to talk about the blogs that really helped prepare me for the program and life abroad as an American expat. I hope they help you as much as they did me! From 2010 to 2011, Liz worked in a pueblo just outside of Córdoba in Andalucía (southern Spain), and repeated the program for 2011-2012 up north in Logroño, the capital of La Rioja. Before going through the language assistant program, she spent a year in Salamanca and a summer in Madrid, so she definitely knows her stuff when it comes to Spain. Also very well-traveled (across most of Europe! ), she has decided to enter the field of travel blogging and writing, so you should keep following Liz’s interesting blog even though she’s no longer a language assistant! Like Liz Carlson, Liz Pitt also studied abroad in Spain in college before coming to the country as a language assistant in 2010. She and her boyfriend, Matt, taught in the city of Bilbao, in the Basque Country (northern coast of Spain), from 2010 through 2012. She posted quite consistently during her stay in Bilbao, writing about daily life, teaching, and travels across Europe. Like Liz and Liz above, Kaley also studied abroad in Spain in college, but she worked as a language assistant in Zamora, Castilla y León (north central Spain) for the 2010-2011 school year. While there, she ended up meeting her future husband, Mario, and has since been blogging about her wedding, honeymoon, and new life in Madrid. Here’s one of the few guy bloggers I’ve come across while traversing the blogosphere (nothing against these very fine blogs written by women; Graham’s is just the only one written by a fellow man I’ve seen). Graham spent two years working in Madrid, the capital, first as a language assistant in 2010 and then as a full-time history teacher in 2011. Currently he’s attending graduate school in Barcelona. His long, expressive posts recount the great international experience he had working and living abroad. Sarah and her husband left the U.S. in 2010 for Málaga (southern coast of Spain), where they worked as language assistants for two years before returning stateside to attend law school. Perhaps the most outstanding part of her blog is her photography; the pictures she posted of paella, tortilla, and travel are simply top-notch. From 2009 to 2011, Lauren worked at a school in Sevilla, Andalucía, but partway through her stay there, she met her future husband, Alejandro, and got married. Now based in Madrid, she manages a clutch of Spain-related blogs, including Teach & Travel Spain and Recetas Americanas, and runs a business she started, the Madrid Food Tour. While in college, Cat studied abroad in Valladolid (north-central Spain) in 2005, and came back to the country in 2007 to be a language assistant in Sevilla for three straight years. She found her current boyfriend, steady teaching work, and a new life in the Andalusian capital, where she resides today. I actually met her in April 2013, and she’s a great gal! 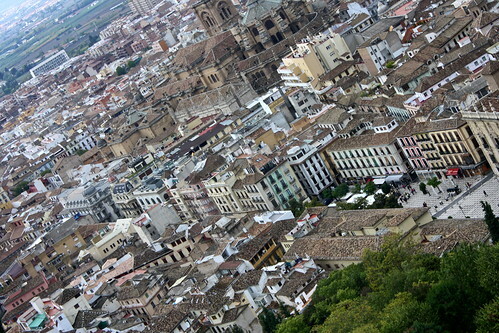 Her blog is especially helpful for all things Sevilla, since she’s been living there for five years now. For current (and veteran) language assistants, which blogs would you add to this list? Link to them below in the comments!